Bonhams, London 5 July 2017, lot 65 (as ‘Circle of Marcus Gheeaerts the Younger). London, New Gallery, Exhibition of the Royal House of Tudor, 1890, no. 479 [lent by Mrs A.C. Hyde]. A. Graves, “A Century of Loan Exhibitions”, London 1913, p.1424. 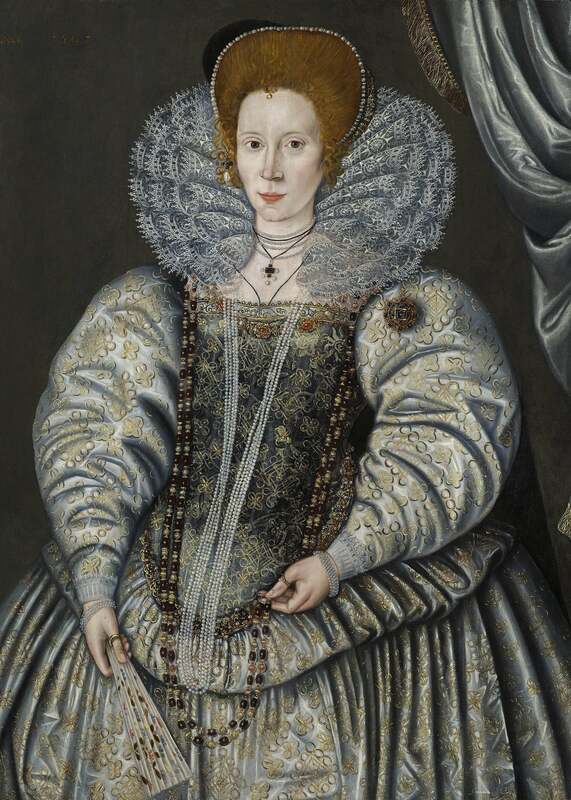 There is no reason to doubt the traditional identification of the sitter as Elizabeth Raleigh, née Throckmorton (1565 – c. 1647), and the date of the portrait, 1595, would make her thirty.She was the daughter of the diplomat Sir Nicholas Throckmorton and Anne Throckmorton (née Carew), courtiers to Elizabeth I. Through both her parents, Bess had connections to Henry VIII. Her father was the cousin of Henry’s sixth wife, Catherine Parr; and Anne Carew, her mother, was the daughter of Nicholas Carew, a close friend of Henry’s from childhood. Elizabeth’s marriage to Sir Walter Raleigh, in July of 1591, was carried out in secret, when she was already pregnant with their first son, Damerei. This precipitated a long period of royal disfavour for the couple. Although they had married without royal permission, significantly, another of the Queen’s favourtites, Robert Devereux, 2nd Earl of Essex, nonetheless acted as godfather to the child. Elizabeth I found out in 1592, she placed the couple under house arrest, later sending them to the Tower of London in June of that year. Raleigh was released from in August and Bess in December, joining her husband at Sherborne Castle, his Dorset estate. The queen expected the couple to sue for pardon, but they refused to, and so Raleigh would remain out of favour for a further five years. The Raleighs’ second son, Walter, was born in 1593 at Sherborne. The couple's third son was born in January 1605, by which time Raleigh was again a prisoner in the Tower of London. After Raleigh's execution in 1618, Bess worked tirelessly to re-establish her late husband’s reputation and, in 1628, saw a Bill of Restitution restore the Raleigh name ‘in blood’, which allowed her one surviving son to inherit. Bess is said to have had her husband’s head embalmed and to have carried it around with her for the rest of her life, although the only documented reference to Raleigh’s head is from the day of his execution, when it was noted that Lady Raleigh and her ladies left the scene carrying Sir Walter’s head in a red bag. An account from 1740 claims that, after her death, the head was returned to his tomb in St. Margaret’s Westminster.